Nightwatch Fully Illuminated Display. SoundTraker System Cuts Noise up to 90%. 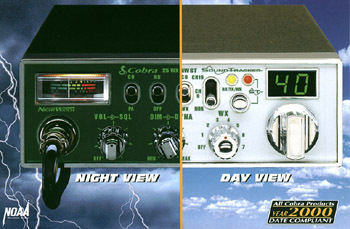 **40 CB Channels **7 NOAA Weather Channels **9' Microphone cord **Nightwatch Dimmer Control **Front Panel Microphone Connector **7 1/4" x 2 1/4" x 8 5/8".